A confessional. Via Wikimedia Commons. On a spring evening at dusk, sitting next to the fire pit with a glass of wine, my mother told me what it was like to go to confession before the Second Vatican Council. First of all, that is what it was. There was no “Reconciliation.” There was no “Reconciliation Room.” You went to confession. You went in the confessional. You went once a month, every month. Mom’s impression was that this was church law. But it wasn’t, not really. 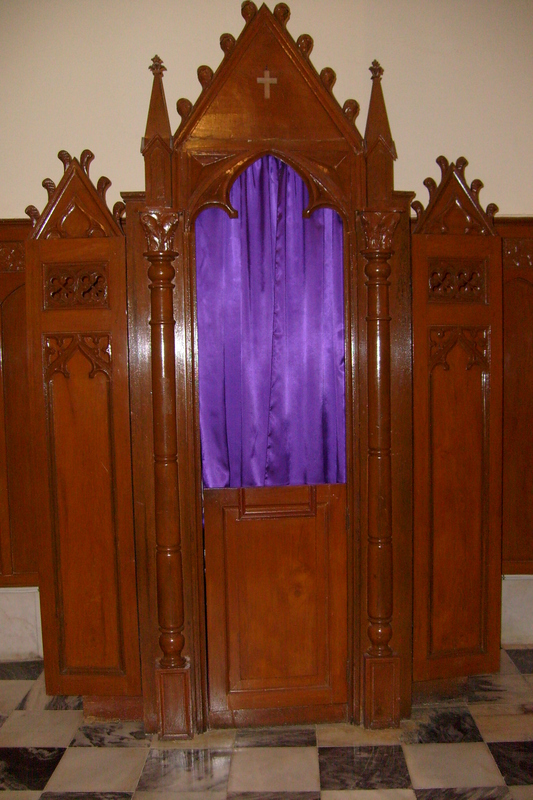 The minimum rate of going to confession was pegged to the minimum rate of receiving Eucharist. In other words, once a year around Easter. But in those days, things that seemed to be law had as much force as things that actually were law. You went on Saturdays. Mom dreaded it. She hid in her bedroom, hoping her mother would forget. It was fruitless. Sometime in the afternoon, the shout came up the stairs from the kitchen. Mom sighed. She changed into a dress. Women and girls did not appear in church unless they wore dresses. She also put on a babushka. Women and girls did not appear in church without head coverings. It was always Mom going alone. She does not remember her parents or brothers ever going with her. Boys found ways around things they didn’t want to do. And her parents were waiting for the church to get a Polish-speaking priest. Or so they said. In church, Mom joined a silent, awkward line. If the priest in the box was the pastor, Mom might wait with special discomfort. The pastor was tough. He used his homilies to guilt parishioners who didn’t tip enough into the collection, or who sneaked through the door late. Standing in line, Mom could distract herself by looking at the stained glass window of Pope St. Pius X, recently canonized. Pius’ vocal preference for early, frequent confession had, in essence, brought Mom here. Or she could examine the statue of St. Rocco. He poked his finger into a leprous sore on his leg, as if to demonstrate it to onlookers. Mom could also gaze at the statue of the parish patron, a bishop who carried rocks precariously balanced on his Bible. We found out later the rocks were gallstones. The confessional door swung open and shut with regularity. At last it shut behind Mom. Now she was on her on her knees in the dark, telling personal secrets to a strange older man with whom she otherwise never interacted. This was a setup that felt wrong to her from the beginning. What also bothered Mom was that, frankly, there weren’t any secrets to tell. At the age of ten, she couldn’t think of what she was doing that was so wrong that she needed to be here so much. Eventually she settled on a standard laundry list that she kept on standby just to have something to say, whether she had done anything on the list or not. The penance for her list oscillated within iron yet somehow arbitrary bounds. Three Our Fathers, one Hail Mary. One Our Father, three Hail Marys. Three and three. Two and two. And then it was over. She was free. It was like being out of school for the summer. The cycle was perpetual. In saecula saeculorum. Forever and ever. Amen. When I was a kid, we were “Chreasters,” Christmas and Easter churchgoers. We would go more if I was preparing for a sacrament. And I “got all my sacraments.” We were still a Polish family that kept up appearances. But if we didn’t have to go, we didn’t go. Mom decided this. When I expressed interest in going to Mass more often, Mom was visibly irked, even hostile. Once she told me that she was raising me to trust nobody, and that “nobody” especially included priests. When Confirmation time came and I shoehorned myself in as a lector and volunteer, thereby making sure we went to church even after I was confirmed, Mom worried that I was joining a cult. She told me so. When I began to talk to people from church on the phone, she fretted even more about my cult-joining tendencies. But I was devout by virtue of inborn temperament. I wanted a structure, something to believe in. And when I encountered Mom’s resistance, resistance that mystified me, I dug my heels in even more. The theology degree that hangs on my wall is a testament to just how hard I could make my heels dig. It was only when I began to hear her stories that I finally understood. Mom equated the church with dominance and submission. She wanted to protect me from it. And as I moved into my twenties, I realized the unofficial, unspoken qualities the hierarchical church wanted me to cultivate: anxious, rigid, un-centered, dependent on external validation. I conceded that Mom was not wrong. But, as my continuing involvement in parish life and the church reform movement demonstrates, I don’t think she was totally right, either. I choose to live, as they say, in the tension. I can do no other. This entry was posted in Hierarchy & Laity, Spirituality and tagged Catholic Church, Catholic imagination, Confession, Family, memoir, priests, Sacrament of Penance, Sacrament of Reconciliation, sacraments by Justin Sengstock. Bookmark the permalink. My mother also hates confession, and reading your post gives me greater insight into what her experiences growing up might have been. I used to find it “cleansing” when I went before Easter every year (we cheated and went to “communal confession” until they stopped offering it — probably b/c the bishops were cracking down), but now the thought of it makes me feel a little more like your mom dredging up her standard laundry list. It’s not that I no longer sin (how nice would that be?) but that I make peace with it in ways that don’t require me to sit in a dark room with a stranger. I go directly to God, which my Protestant friends urged me to do all along when I was growing up. And I also try to right the wrongs to the extent that I can — apologizing to those I’ve hurt, mainly, and resolving to do better next time (that part hasn’t changed!) This always feels more restorative than six hail mary’s or a rosary, both of which I can (and do) assign to myself for a whole host of reasons. I’m glad that you were able to come to a place where you understood where your mother was coming from, but also that it didn’t cause you to fall away by default. Have you shown her this post? I’m sure she would be gratified to see how deeply you’ve absorbed her experience. I haven’t shown Mom, not yet, anyway. But I asked her if I could use the story, and she waved her hand and said, “Go ahead.” I’m not surprised. She’s been one of the people who nudges me to write without fear or favor.